Santiago de Querétaro took about half a day to become my favorite stop in Mexico so far and join the ranks of my favorite destinations worldwide. Which is why I was so disappointed when I realized that consulting a guidebook or Googling Mexico travel topics almost entirely omits the city’s existence. Gracias a dios, I stumbled upon it by accident. Santiago de Querétaro, or simply ‘Querétaro’ as Mexicans refer to it, may be the first place I’ve ever felt safe calling anything like a ‘hidden gem’. Tripadvisor requires three clicks of ‘See more popular destinations in Mexico’ before finally revealing Querétaro at #19. 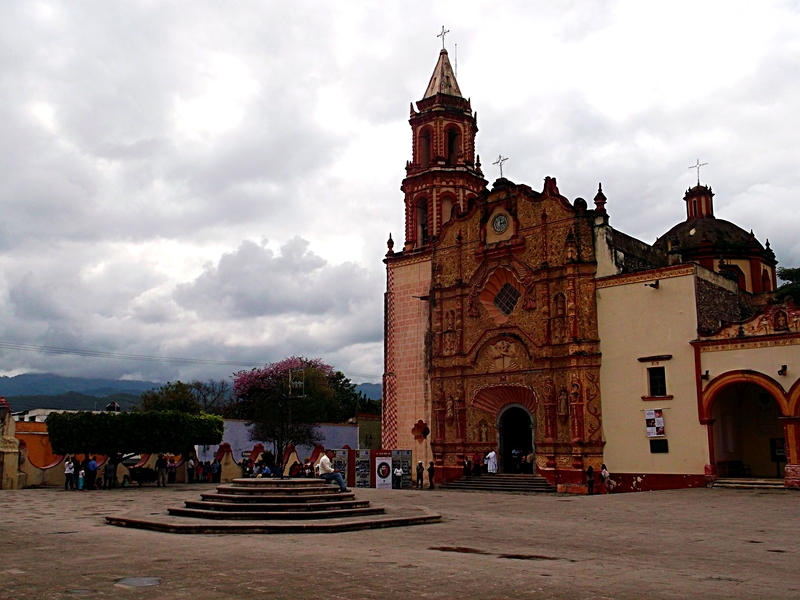 Lonely Planet says that it’s often considered the “ugly sibling” of the silver cities of the Bajío. Even good ol’ user-maintained Wikitravel’s main Mexico page only mentions Querétaro long enough to point out that it’s reachable by most major bus lines. A map of this leg of my trip. Querétaro is the third orange box, right in the middle of Mexico. 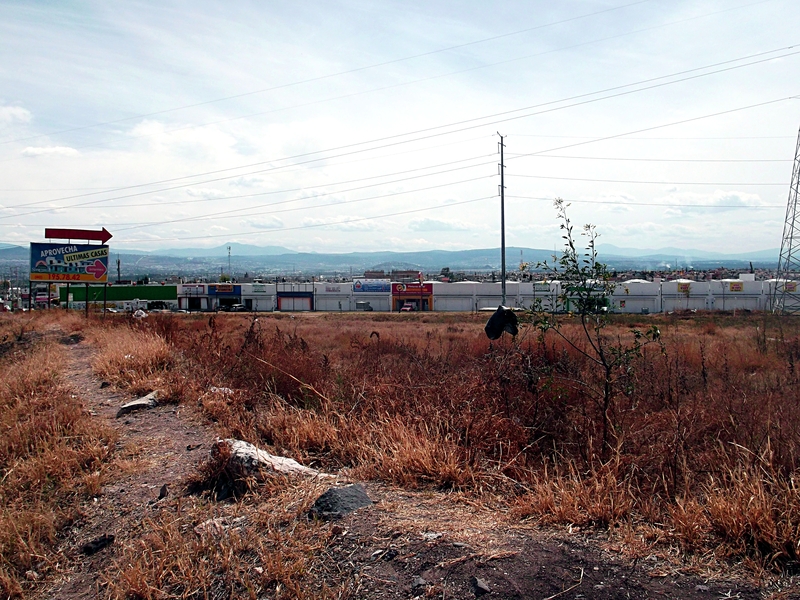 Querétaro’s geographic blessing is also part of its touristic curse: Mexico’s three biggest cities — Mexico City, Guadalajara, and Monterrey — form a triangle surrounding Querétaro, and for that reason it’s often lost in the shadows of its giant neighbors. But in a world of half-full glasses, this is a major positive: the city is nearly the exact geographic center of Mexico, which is good news not only for cartographically-inclined sufferers of Obsessive-Compulsive Disorder, but also for those looking to stake out a good home base for their Mexican explorations. Mexico City and Guadalajara are both reachable within about three and a half hours of Querétaro, but they’re not the only convenient weekend trips. An hour or so to the northwest, San Miguel de Allende and Guanajuato are kicked anthills of retired gringos and backpackers alike, stealing the regional spotlight from Querétaro. While I didn’t go to either of these cities, I met several travelers in Querétaro who were on their way to or from the nearby tourist destinations, and most of them agreed that Querétaro has all of the positives without the smothering tourism. That’s for you to decide, but I highly recommend informing that decision by setting up shop in Querétaro and taking the short and cheap bus ride from there. The Franciscan Mission at Jalpan de Serra, one of the five sixteenth century Spanish missions that make up a UNESCO World Heritage Site in Mexico’s Sierra Gorda mountains. 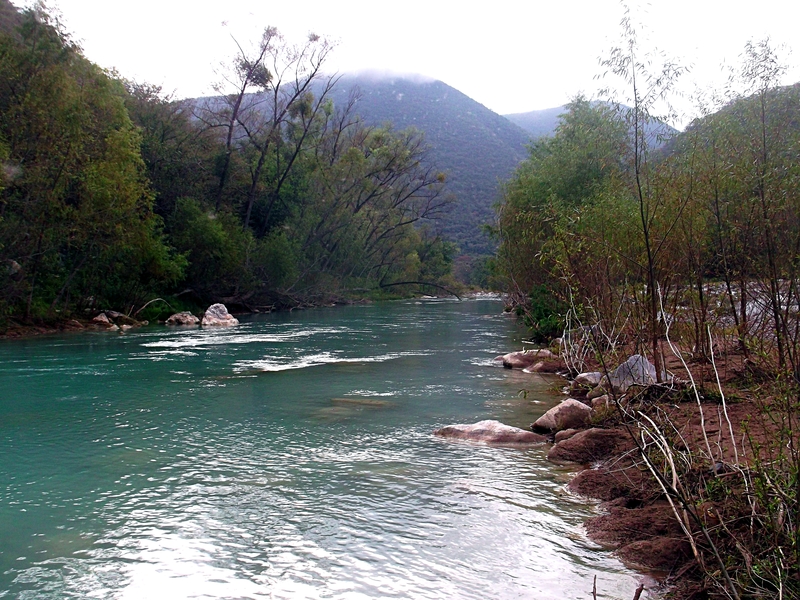 The Río Escanela in the Sierra Gorda mountains, where I camped out with a Couchsurfing friend after visiting the missions. 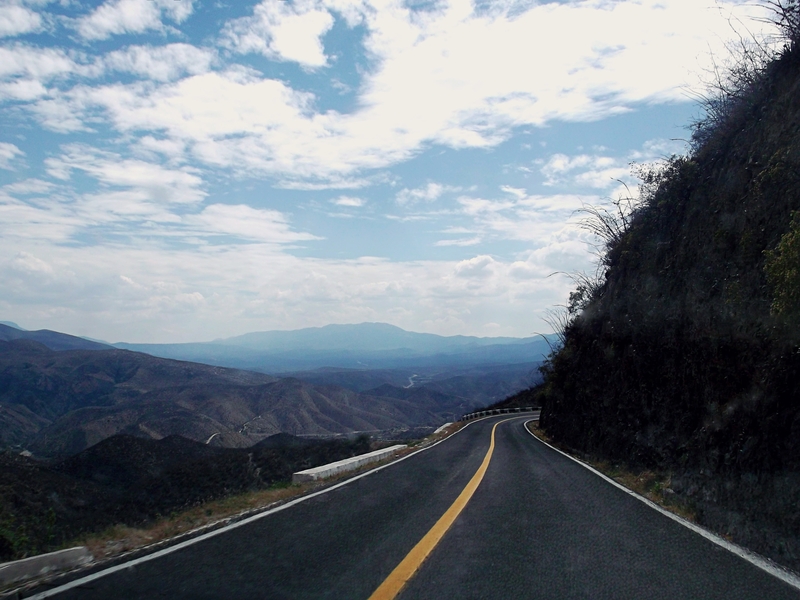 For the traveler whose feet itch to get off the paved city blocks and into nature, it’s barely two hours on the highway to reach the Sierra Gorda Mountains. On the way you’ll drive over valleys and watch the nearly instantaneous shift from semi-desert to subtropical rainforest climates, and then visit the Franciscan Missions of the Sierra Gorda and/or go camping, all of which I did while in the area. The road through the mountains, just after the rather abrupt shift from lush forest to arid semi-desert. When I got to Querétaro, I realized I was starting to tire of a Goldilocks-esque survey of Mexico: Monterrey is enormous and crowded and confusing, but San Luis Potosí is a bit over half a million people and feels isolated, like its population is only half as much. Querétaro, however, is just right. The sort of semi-suburban neighborhood where my Couchsurfing host lives on the northern edge of town. From here you can hop on a ten-minute bus into the city center. With about 800,000 inhabitants all living in the close quarters of the colonial city streets (but without feeling jammed in) a couple hours’ bus ride from half of Mexico, Querétaro is the happy medium. There’s no sense of isolation there, and in fact you meet transplants from all over Mexico and the world. But it falls short of being overwhelmingly large: traffic is okay, everything is reachable, the historic center is walkable, and people are friendly like small-town folks. I myself have a weak spot for gigantic metropolitan shitholes (I write these words lovingly from the heart of twenty-two-million-inhabitant Mexico City), but Querétaro reminded me why it’s nice to get a break from said holes for a while and plant yourself close to them without buying a farm in the countryside and marrying one of your cousins. 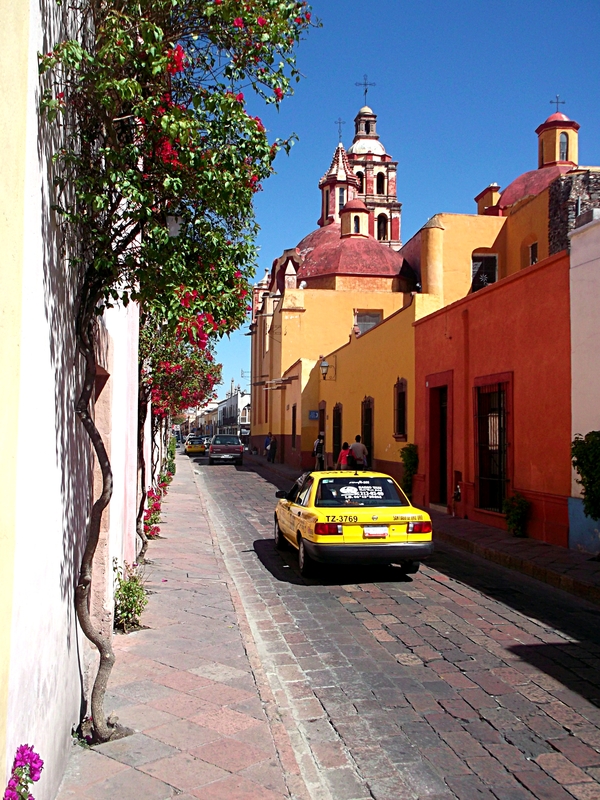 Querétaro was founded in 1531, and nearly half a millennium later it’s still beautiful and thriving. While it’s not the most poppin’ nightlife scene in all of Mexico, it’s the ideal city for anyone who loves to walk around in perfect weather while feeling your mood rapidly lifted to unreasonable heights by the surrounding scenery, especially in the historic center. Querétaro’s Centro Historico wasn’t named a UNESCO World Heritage site for no reason. The main one is architectural: modern-day Querétaro maintains its Spanish colonial street plan, mostly geometrically perpendicular lanes crossing winding streets and alleys that crawl around the contours of the hilly topography, meeting in pristine plazas like the Plaza de Armas or Jardin Zenea, two of my personal favorites. The Palacio del Gobierno, Theater of the Republic, and the 18th century Acueducto are all to be found within walking distance of each other here. So much of your experience of a city depends on where you stay, and I got quite lucky with the Blue Bicycle House. Normally I would be Couchsurfing, but while in Querétaro I had a lot of work to do, so rather than converting a kind stranger’s house into my own personal office, I thought I’d splurge the $12 USD per day on a bed and a little independence. The terrace at the Blue Bicycle House at sunset. Photo from Trip Advisor. And I’m glad I did. The Blue Bicycle House’s biggest appeal is the roomy terrace with its spectacular view of the city and the mountains around it, which turned out to be a great place to work under the constantly shining sun and clear skies. They also have two namesake blue bicycles available for the guests to explore the city, and an aggressively friendly cook who’s at your disposal from 9 to 5 every day. February is a bit of a low-season for tourism in the area, but even without many other co-hostellers I had a great time hanging out and chatting with the hostel staff. 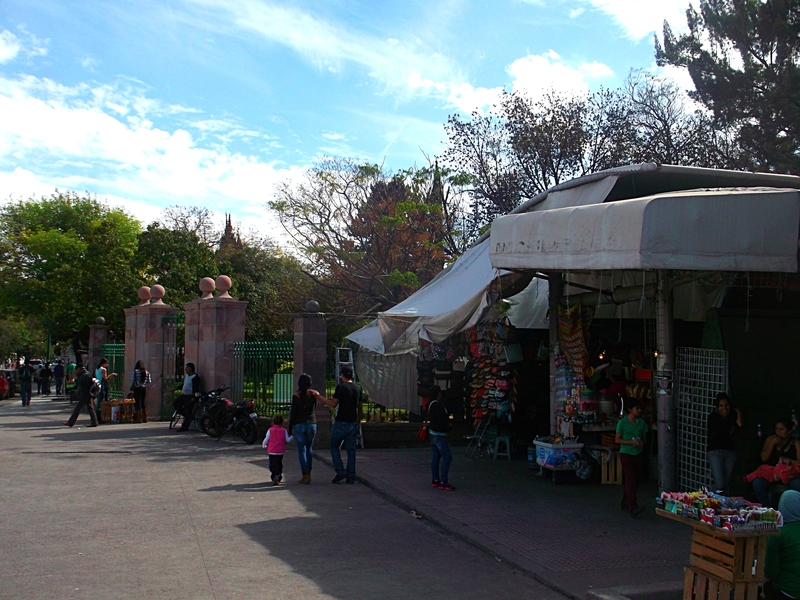 Entrance to the Parque Alameda, with puestos around the gate. 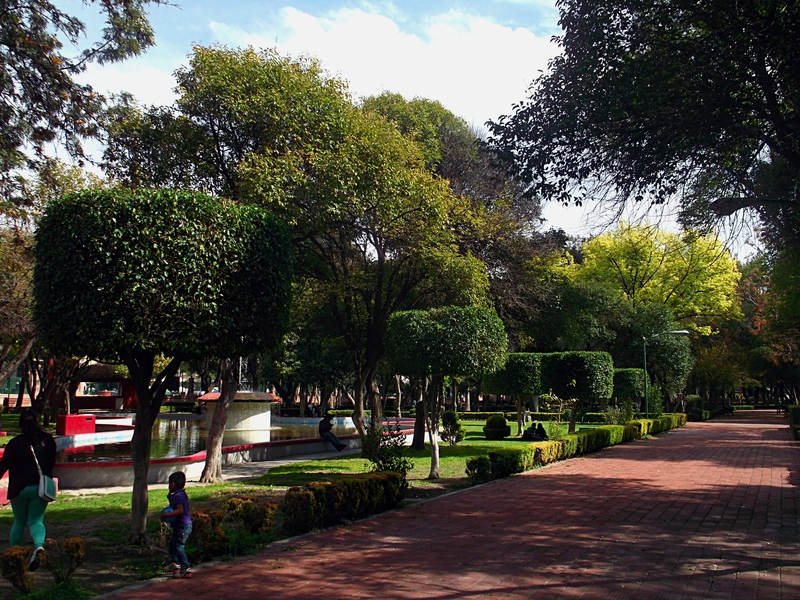 Every Mexican city seems to have a Parque Alameda (I’ve been to three of them), but Querétaro’s has been my favorite so far. Simply put, it’s enormous. 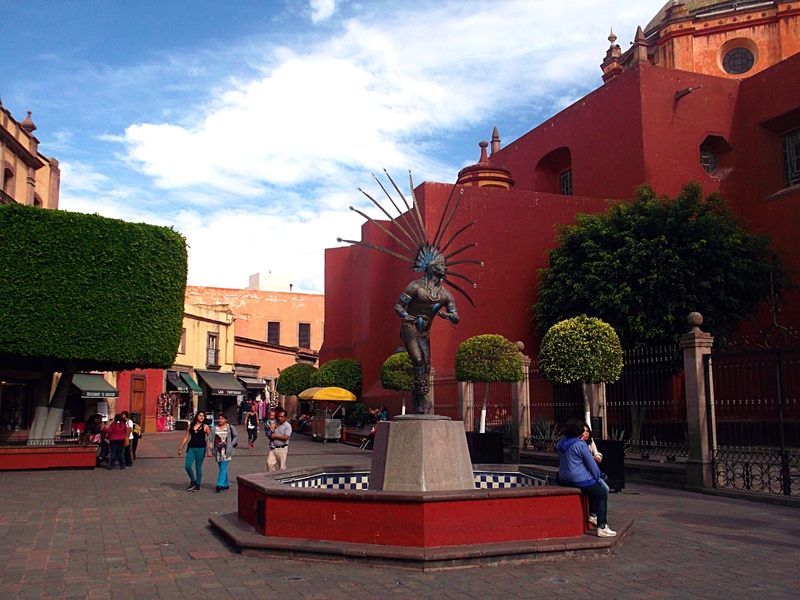 It sits in the center of the center, a square monstrosity of towering trees, colorful flowers, and pristine sculptures surrounded by an imposing wall on all sides and encircled by puestos and artisanal shops on every day but Wednesday. As if the rest of the city and its historic center weren’t soothing enough, the Alameda is where you can go for a jog or a walk or just to sit on a bench and soak up some perfect weather. High standards of living, the second highest per capita GDP of the country, and its geographic position all contribute to Querétaro being one of the safest cities in all of Mexico. In fact, statistically speaking, it’s generally considered the safest or second safest city in the country. 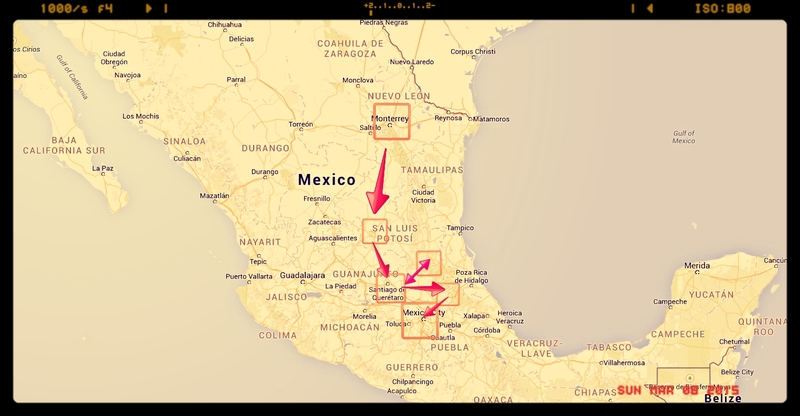 There may be more to this than the simple demographic explanation: there’s a popular rumor in Mexico that the major cartels have agreed to leave Querétaro and the surrounding areas as a sort of no man’s land, a safe territory where cartel members can send their families with the guarantee that they won’t be attacked by their rivals. It’s not certain, but there have apparently been many arrests of cartel higher-ups in recent years in the city, most of them caught while visiting family. Whatever the reason, you can feel safe wandering around most of the historic center at any hour of the night, and most other parts of the city as well. Querétaro is absolutely the most living Mexican city I’ve seen so far, due in part I think to its safety and eclectic demographic mix. You can’t venture out far into the city most nights of the week without encountering bustling alleys or packed plazas full of people watching mariachi bands or outdoor pianos. Sculptures in the Centro Historico. At night, this fountain is surrounded by guitars and a capella singers. There’s something powerfully and almost bizarrely uplifting about walking around Querétaro at night. Even in relatively safe cities like Monterrey and Pachuca, there’s a tangible sensation of guardedness for just in case scenarios (or maybe I’m imagining this with my media-saturated brain?). 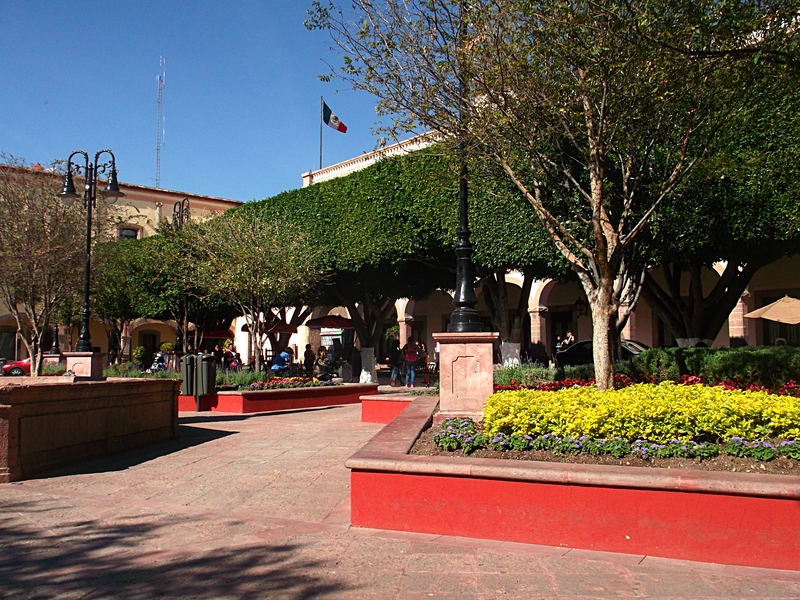 But in Querétaro, you see students typing or Skyping away on their laptops in the parks at dusk, young girls walking home alone, couples carelessly pushing strollers, and groups of youths laughing after one (or more) too many drinks. When you see this against the background of the vibrant live music, you can’t help but be swept up in the charming, relaxed atmosphere of the city. The Plaza de Armas, my favorite place to sit and type the afternoon away under a clear sky and a great wifi connection. Free wifi doesn’t seem to be a huge priority in a lot of Mexico, and too often even the wifi that residential citizens are paying for is far from reliable. However, in Querétaro, nearly every park and plaza is plastered with Free Wifi Hotspot signs. Even better, it (generally) actually works. 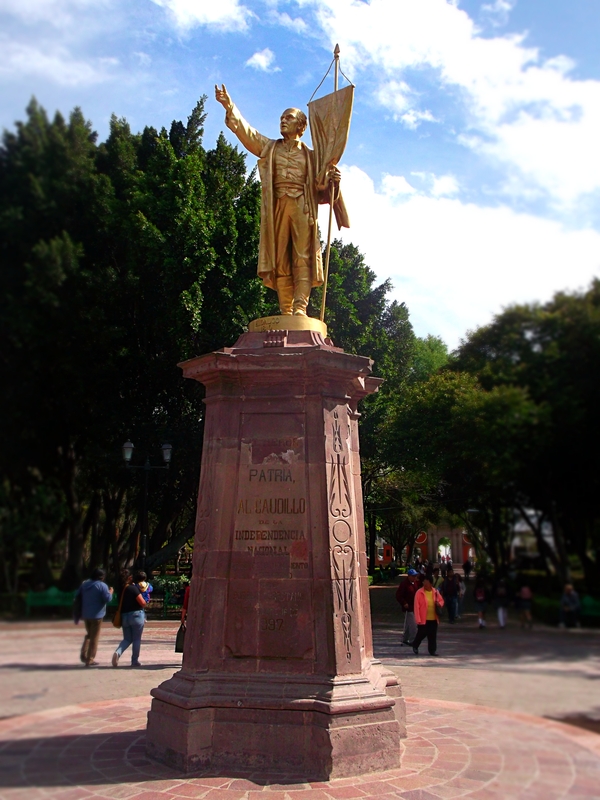 This is one of the reasons Querétaro is considered one of the most ‘dynamic’ cities of Mexico and Latin America. 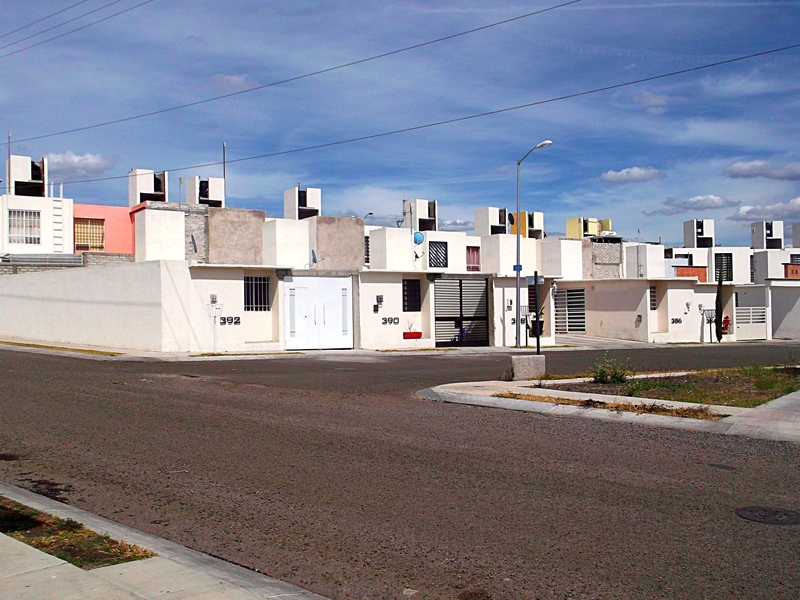 Querétaro isn’t really in the running for Most Cosmopolitan City of Mexico, but in its own way it serves a healthy portion of internationalism for its medium urban size. My first day there, I met an older man in my hostel, a Canadian who was moving to Querétaro to teach English at one of the universities. He wasn’t the only such English teaching transplant I met there, and the three universities, one of which a branch of the prestigious TEC de Monterrey, mean there must be many more foreign students and teachers who I didn’t meet. The Couchsurfing community in Querétaro was also a pleasant surprise, with multiple weekly meetups. I attended one event, an intercambio (language exchange), where I ended up being the only American in a sea of native Spanish speakers. Small groups of Mexican, Argentinian, Guatemalan, Colombian, and Spanish friends switched in and out of English, making efforts to practice with each other but quickly falling into the more natural shared native tongue. Somehow I ended up twisting the event into free mass Spanish lessons for me. Reflecting on it a few weeks later, I think part of the reason for my gushy feelings toward Querétaro is that it reminds me a bit of Leiden (where my wandering heart is still tethered). It’s not a very big city, but it’s big enough and close to a lot that’s bigger. It’s not London or New York, but it’s also not culturally isolated countryside. It’s sigh-inducingly pretty and generates an atmosphere that puts you at ease and makes you feel social and relaxed. Add to that that it’s cheap, the food is fantastic (even for Mexico), the weather is nearly always perfect, and it’s absolutely bursting with little cafés where you can set up your laptop and look important while you obsessively Facebook, and you’ll see why I suffered several bouts of GET CAREER BUILD HOUSE BE BORING DIE while there. You don’t have to settle down and sew your seed, but you’re missing a singular experience if you skip Querétaro on your cross-Mexican adventure. For now I guess it’ll stay a semi-secret known only to those who come close enough to get sucked in by its gravitational pull, but you’d be doing yourself a favor to jump off the backpacker-beaten path and into Querétaro and earn your hipster points before it gets cool. 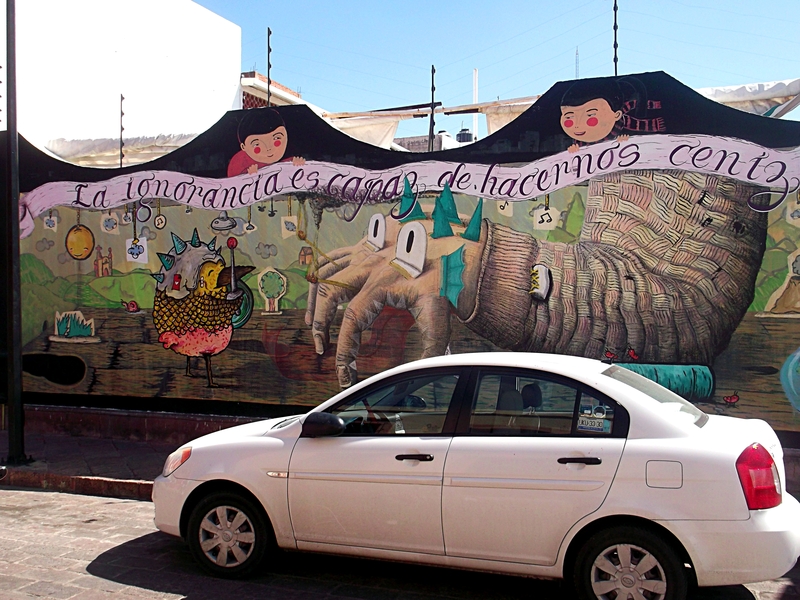 Have you been to Querétaro or another hidden-in-plain-sight city like it? Share your thoughts in a comment here or in a tweet to @JakobGibbons. I agree everythingyou said! I’ staying here to learn a basic Spanish for my Cross- Mexican Adventure… Thank you for sharing this ! I was so happy to come across this blog post, because I’m leaving for a solo trip there and to San Miguel in two weeks! As a solo female traveler, I always do a lot of research before choosing my destinations to make sure they’re safe, but based on that and what you said, it does seem like a safe and fun choice for myself. :-) If you have any other tips for visiting Querétaro not mentioned here, I would appreciate any additional insight! I’ve got 7 days to divide between the two cities and am wondering if I should venture out to explore any other nearby cities. Thanks! !